GOOD BREATHING: Wow, now I can finally take a deep breath, said Clara Winther both pleased and surprised. For over twenty years she struggled with asthma and had to use medication and an inhaler and astma spray. When Pedersen prayed for her on February 9 this year, she was healed. Clara Winther (33) is originally from Zimbabwe. Already at the age of 12, her lungs were not working as they should. Every time she strained her body, she had breathing difficulties. She was eventually diagnosed with asthma. and when she was 18 she started taking asthma pills. - I used medicine in the worst periods. Often I had difficulty breathing when I was working hard and when I ran. I have never been able to take a deep breath. In addition, I reacted in dusty rooms and to pollen from some bushes. Then my eyes would start to water up and run, and it was absolutely terrible. Also at night it was challenging. When I laid down, I always had a hard time falling asleep. I always had trouble breathing, Clara says. Eventually, Clara moved to Denmark, where she married and had children. 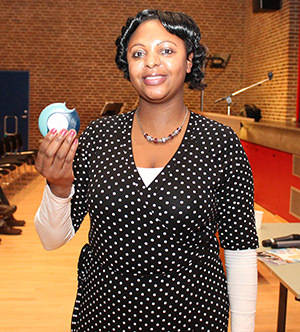 In Denmark, the health problems subsided, but usually she had to use asthma spray once a week. For a time she worked as a cleaner, but the work was very hard on the body. Lately, she had therefore worked at a retirement home, which was better for the lungs. One day, her mother-in-law told her that a healing preacher from Norway was going to be visiting Billund. Clara decided to go, and on February 9 this year, she, her husband and their daughter made the thirty kilometer long trip from their home town of Gesten to Billund Center. -It was an awesome presence of God's Spirit in the meeting, and the sermon and the worship was good. When Pedersen prayed for me, I felt a warmth in my chest and lungs. After a while I tried to breathe deeply, and for the first time in twenty years, I could do this without any problem. It was absolutely amazing! Now I do not feel asthma anymore. My daughter has also struggled with asthma and was prayed for by Pedersen. She also noticed a big difference, says Clara Winther.